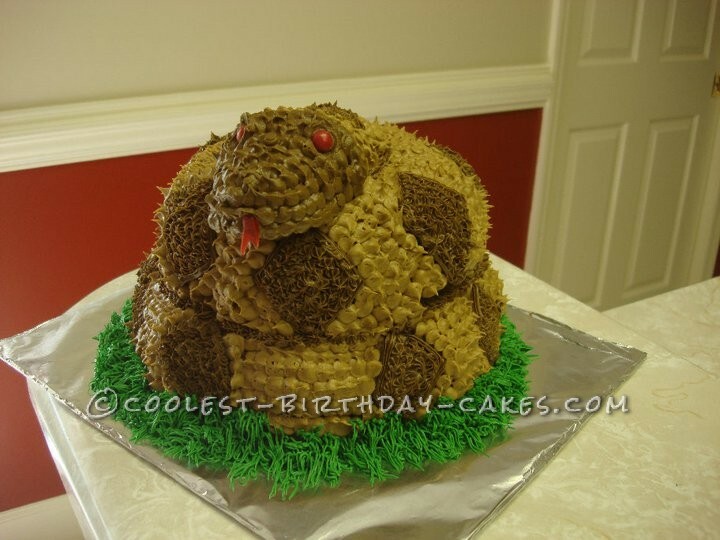 I have a friend that’s quite a prankster, and she wanted to scare one of her co-workers with this Rattlesnake cake. I wasn’t sure how I was going to do a coiled up Rattlesnake, but after a few days of thinking, and one bundt cake later, it hit me! Take a bunt cake pan and use that as the coils. The hole in the middle of the pan, allows to add a head for the snake. I took two bunt cakes, stacked them together with icing in between to keep them steady, and placed them on a board. After that, I had to figure out how to make the head, which quite frankly is just the tip of a cake made in a cake pan that’s from a joke store. It’s of the male nature, and I probably shouldn’t say it here, but I’m sure by this point you get the jist. After placing that tip cake on top, to make it look as if it’s in the coils, I mixed up my two colors of icing. I used the round tip to make the scales on the snake, and the star tip to make the scales for the diamond patterns. I added red M&M’s for eyes, and a the tail of a Swedish Fish candy for the tongue. 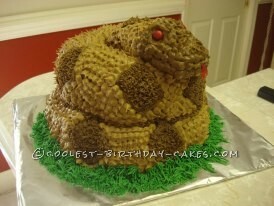 Piped in some grass, and you have a scary coiled up Rattlesnake cake! Perfect for Halloween, or the man that doesn’t want a girly birthday cake!